Like I've mentioned before, I like to walk or ride on the rail trail near my place. It has all the joys of being 'in the woods' but is also right beside a major roadway, so I don't have to worry about bears. Periodically the trail crosses roads or driveways, but there is good signage that lets you know well ahead of time. I recently encountered some friendly motorists at one of the trail crossings. On both my way through and on my way back, two different drivers stopped at the trail crossing (which is not a required stop) and waved for me to cross ahead of them. 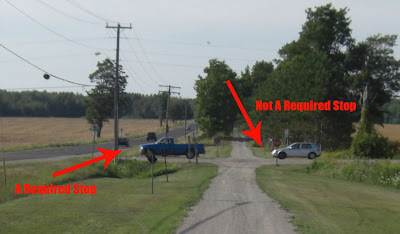 The distance between the trail crossing and the actual stop sign is not that far (see photo), so I wouldn't have had to wait very long if they went first, but their random act of kindness made my day. That picture looks like where we live. Oh yeah. It really is. I'm lucky if the car stops when I'm walking in the crosswalk!!! Some drivers just aren't so courteous. It's so true - that is why it made me so happy that they stopped. It is nice to be noticed as a pedestrian/bike rider.